Lock in a great price for Rum Stars camp – rated 9 by recent guests! Very welcoming staff and the food was excellent. The tours and day trips were lots of fun and the location was fabulous as were the facilities. 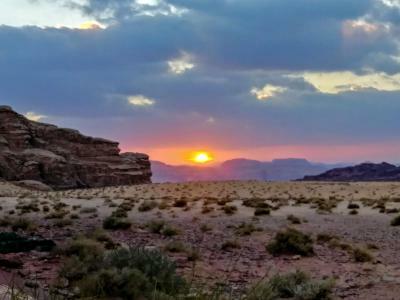 You can’t pick a better camp in Wadi Rum to experience the Bedouin lifestyle. What a great location!!! This Bedioun camp set off by itself in the Wadi Rum desert was a true find. Didn't know what to expect, but this place exceeding any expectation. The staff was friendly, the guides very knowable and entertaining - especially Abdul - the Bedioun Man! The accommodations were like wall tents, but very comfortable with electricity. The only thing that kept us up at night were the stars! Couldn't imagine a more magical stay! The location of the Rum Stars Camp is exceptional. Off the beaten path and in a beautiful location. Stargazing was out of this world. Ahmed, the owner of Rum Stars, was very helpful in arranging the jeep and camel tours for us. Eid, our guide, was fabulous! He is very knowledgeable and hospitable, speaks English fluently and patiently showed my daughter how to rock climb to get the best views. Finally, the food at camp was terrific. Both dinner and breakfast were delicious and plentiful. Definetly the staff. All of them are really king and try you have the best experience. You can order excursion by 4x4 and camel tours. We were surprised because we didn’t expect a camp was so clean. The tend was cozy and nice. We really appreciate the athmosphere the kindness of the bedouins and also what they explained us about their culture. Sleeping and going through the desert is an unique experience. Amazing experience. Ahmed and his team are very friendly and welcoming people. The guide showed us wonderful places around the desert. We had a fabulous day. This place is truly magical. Food was excellent. 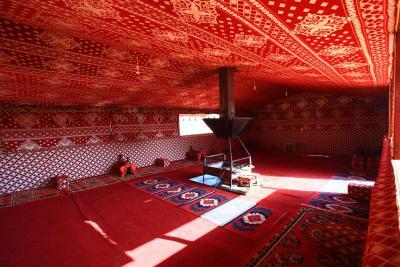 Bedouin tent was comfortable and equipped with really warm blanket. Definitely recommend Rum star camp while in Wadi Rum. 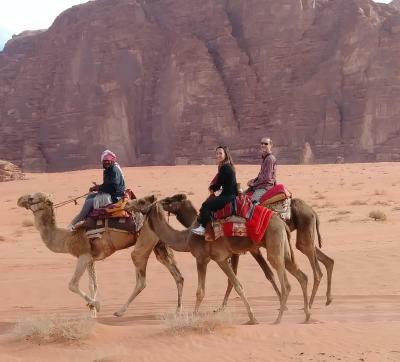 Rum Stars camp provides accommodations in the Wadi Rum Protected area. 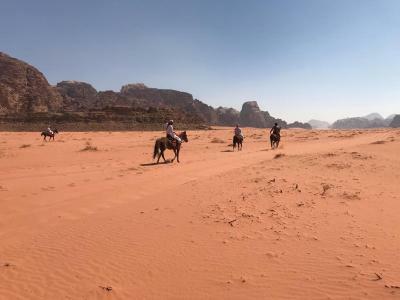 The property is set 4.3 mi from Wadi Rum. The tour desk is available to assist guests in planning their days out. King Hussein International Airport is 25 mi away. When would you like to stay at Rum Stars camp? House Rules Rum Stars camp takes special requests – add in the next step! Please inform Rum Stars camp of your expected arrival time in advance. You can use the Special Requests box when booking, or contact the property directly using the contact details in your confirmation. Food could be better but it s in the middle of the dessert. We had an unfortunate encounter with one of the staff members. My daughter’s (22 years old) boyfriend was at a nearby camp. He walked to our camp after dinner. He was received briskly: “why are you here”? He wanted to sleep under the stars together with us. My daughter asked for a cushion or cot. She was told “no way”. Not the type of hospitality that Bedouins are proud of. Of note, my daughter went to his camp the next night, and THEY rolled out the red carpet for her. Tea, cushions, and warm greetings. That is hospitality. So...if you hope to have the option of sleeping under the stars, which I would have had it been warmer, this is NOT the camp for you. the owner is quite straight forward person and willing to share his point of view about the life and the local people behavior. There was a large group who were noisy celebrating till late night with drink and songs. Some stronger camp rules might help. Personal touch and care taken by management. Excellent food. Beautiful location. Everything went perfectly. Ahmed and his staff have been extremely welcoming and ready to satisfy all our needs. Despite our late arrival he was very helpful in letting us changing plans. The structure and the location exceeded expectations and the dinner was excellent. I am really happy with this stay. Totally recommended. Such a wonderful experience. Salim, the best guide we could have ever asked for! This place and the people living there are truly magical. Food is not good - specially breakfast. Dinner was ok. Water was freezing cold and toilets not well cleaned. It was very cold in the evening - more blankets could have been provided. Great desert experience, beautiful view of the stars. Staff is nice and friendly. Bed is comfortable. Very nice day and night in the camp. Great discovery of wadi rum. Very interesting and sharing moments. 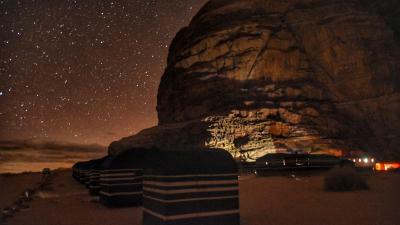 Amazing experience sleeping one night in Wadi Rum. The facilities were very good and Ahmed was very helpful in arranging 4WD and Camel tours. Our guide Abdullah was extremely friendly showing us around Wadi Rum. This is a must experience while travelling to Jordan! It was a fabulous day spent in Wadi Rum with Rum Stars Camp especially with Eid, the best guide in the desert !! He will show you very nice places, he is a cooking man and has a lot of jokes to share :) Merci mon ami ! The camp is comfortable, bedouins are really welcoming and you can do a sunrise camel ride, it is fantastic. We didn't have anything negative to say about Rum Stars! Oh wow, what a camp!! The camp is in an amazing location, quite deep within the desert and canyons! The owner Ahmed, and his AMAZING team of staff at the camp, and guides that take us out into and around the desert, are all wonderful. Such friendly, welcoming, happy and fun people. They really are such a credit to his team! Fabulous food....breakfast set us up for a great start to each day, the wonderful Abdul made us camp fire lunch on our day touring the desert, and then we returned to the most amazing evening meals, cooked the traditional Bedouin way, underground. We had 3 nights at Rum Stars,and we didn't want to leave. Our Bedouin tent was comfortable, with plenty of blankets to keep us warm on the cold/cooler nights in the desert! We were served endless Bedouin tea that was so good! We will DEFINITELY be back. Thank you to everyone for such a fantastic time. As single girls traveling alone we experienced some inappropriate attention from one of the staff members. Mind blowing desert! Rum stars offers a perfect atmosphere and great services, best food during our trip and the full Bedouin experience. We had an amazing day with our guide, absolutely recommended to join them for the full day trip.